The Michigan-based IT company, Arbor Solutions, provides application development, business intelligence, network services, systems engineering, and disaster recovery to midsize manufacturing and wholesale distribution businesses. 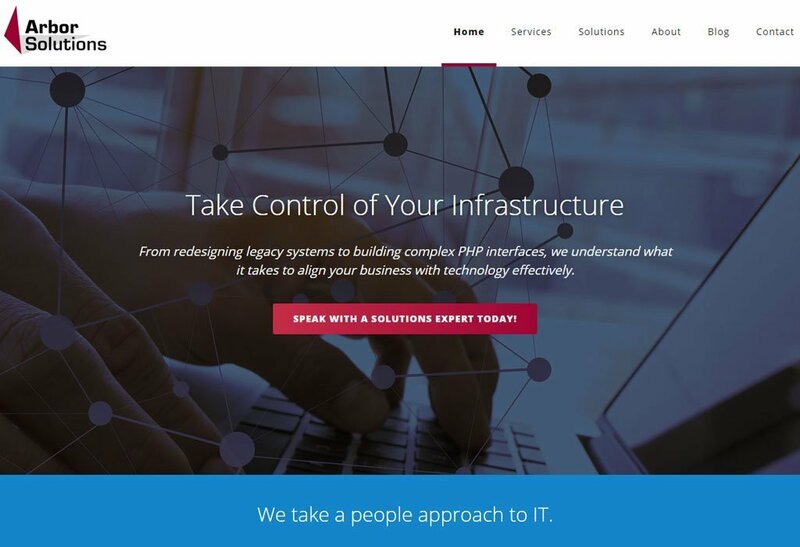 This expert team of IT professionals needed a clean, mobile-friendly website design that could guide prospective clients and describe their industry-leading services. Here’s how we redesigned their site. 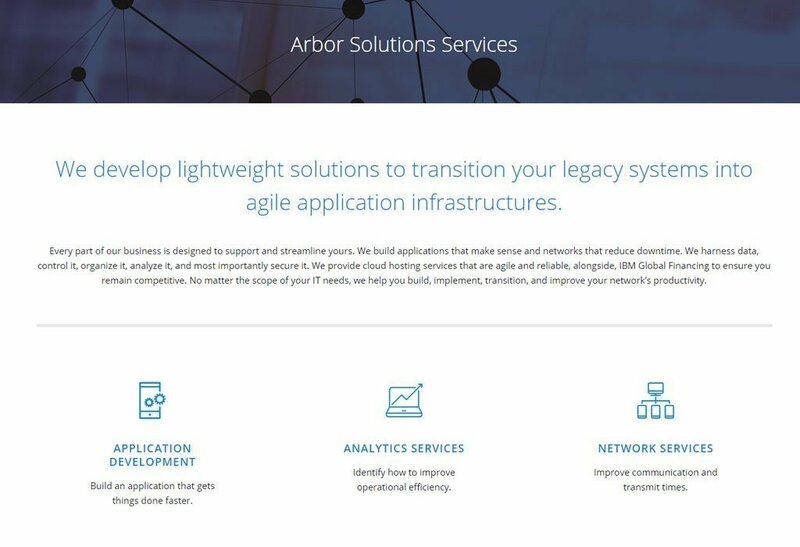 We analyzed their brand identity, and created a perfectly fitting visual design for the information technology services that Arbor Solutions provides. The newly redesigned homepage not only showcases the company’s services. It also features easy-to-navigate links to their offerings. At the bottom of the page, you’ll find a footer with clear site navigation options and contact information. We added two calls to action (CTAs) in order to steer visitors into Arbor Solutions’ sales funnel. The first CTA gives the audience a means to directly contact an Arbor Solutions representative. The second CTA is a lead magnet where visitors provide their email addresses and receive ongoing, monthly tips to help them improve their business’ IT. The Services page outlines each of Arbor Solutions’ offerings in a visually impactful format. Site visitors are greeted with a bold headline and useful, SEO-optimized copy. As you scroll down the page, each service has a recognizable icon and link, which allows visitors to click and learn more about them. Just like the Services Page, the Solutions page features succinct, useful copy. At the bottom of the page, two visually impactful icons denote the company’s Hardware and Software offerings. In this page and the Services Page, we’ve created a persuasive description of how businesses will benefit from working with Arbor Solutions. Every company’s blog should effectively demonstrate its industry expertise and provide valuable content for the company’s target market. However, it’s critical for the layout to be scannable in order to generate more clicks. 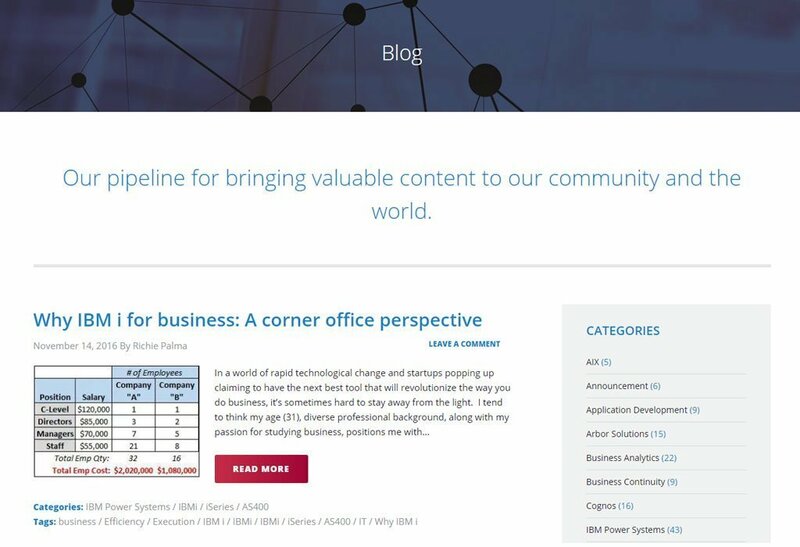 Our team repackaged the exceptional content featured in the Arbor Solutions’ blog, and displayed it in a more aesthetically pleasing format. We also included social sharing options and comment boxes, which invite the audience to engage. Because the Arbor Solutions site is powered by WordPress, their staff maintains total control over the site’s content. We’re using SEO to drive traffic to the site. We’ve crafted unique, persuasive text and compelling calls to action (CTAs) to convert traffic into leads.